Last year, the science community left its comfort zone and marched out into another sphere: politics. 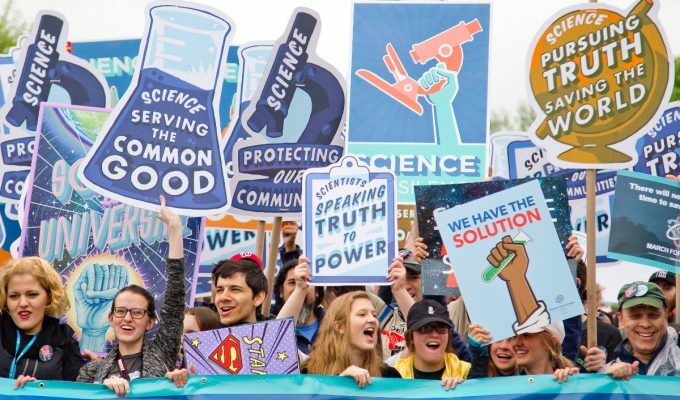 All around the world, scientists and friends of science showed their support for their discipline in the biggest worldwide science protest movement of all time. This year, the March for Science organization wants to build on the success of last year’s event. We caught up with Dr. Rosalyn LaPier, board member of the March for Science organization, to learn what we could expect this weekend. Dr. Rosalyn LaPier, board member of March for Science. Photo: Iko’tsimiskimaki Beck. MOB Prod: How is this year’s March for Science different from last year’s? LaPier: The April 14th “March for Science” Washington, DC rally and events are now just one of many initiatives that the March for Science is spearheading this year. In 2017, we laid the groundwork with a global march. In 2018, we have been focusing on continued activism and action at the grassroots level. One of my favorite initiatives is Vote for Science. March for Science launched Vote for Science in November as part of a year-long campaign. We are encouraging scientists, citizen scientists and advocates to register voters, host science focused town hall meetings, make calls, gather signatures for petitions and participate in our calls to action. I believe this is an important initiative to engender greater participation in our role as American citizens and help educate new voters. This work will also ensure that citizens and science play a role in our political conversation. MOB Prod: What are some lessons learned from last year? LaPier: We have learned a lot of lessons in the past year as an organization, but I will address this on a personal level. One lesson that I have learned this year is that the funnier, cleverer, and snarkier the sign, the greater in impact. Some of our favorite signs from last year’s March for Science rally in Boston. Credit: Suzi Tobias. March for Science has followed the lead of scientists, citizen scientists and communities, since day one, in organizing and taking action. On our end we have created well-crafted calls to action that engage scientists, citizen scientists, and advocates with topics that matter to them and that promote science for the common good. However, funny and snarky works! Signs and memes shared on social media can get people to think, act, and laugh effectively and efficiently. MOB Prod: What are you most excited about for this year’s event? 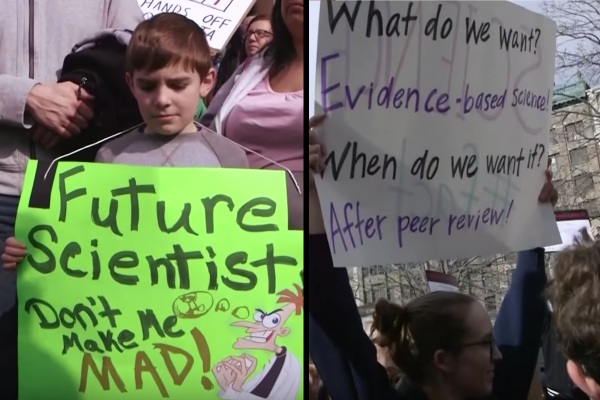 LaPier: Engaging with people who create signs like: “Protest Sine and Cosine.” Scientists and science advocates are smart, creative, and funny… Remember your old science professor or teacher with all those Far Side cartoons taped to their door? 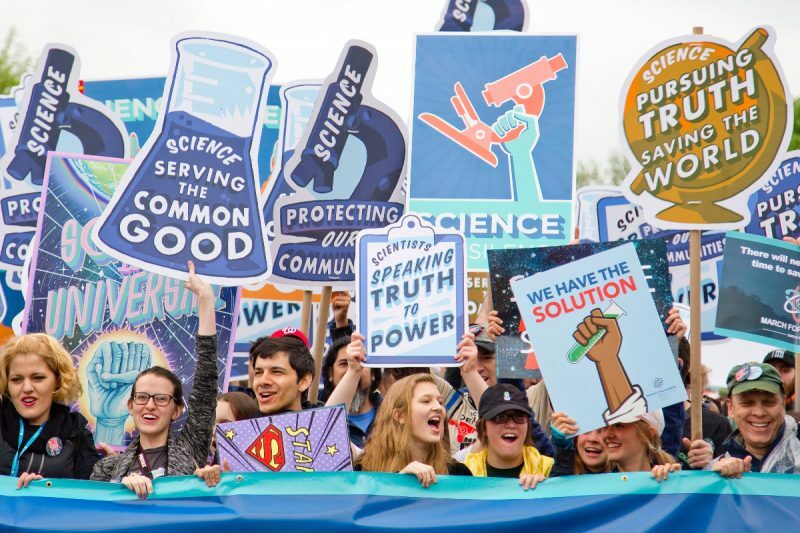 We decided to create a book, “Science Not Silence: Voices from the March for Science Movement,” edited by Stephanie Sasse and Lucky Tran, which highlights the activists and their signs of the March for Science. I look forward to seeing people engaged in the political process with creativity and humor. MOB Prod: What do you want politicians/the general public to know and understand about science/scientists? LaPier: Scientists, citizen scientists, and advocates care. They care about their own communities, they care about other peoples communities and they care about the national conversation related to science for the common good. I am from Montana and I continue to live and work in Montana. In Montana our economy is based on agriculture and tourism. Clean and healthy air, water and landscapes are at the heart of those economies. And for thousands of years Indigenous peoples have served as stewards of the natural world here. Indigenous peoples utilized their long held knowledge (and science!) to engender these places so important to our contemporary livelihoods. However, Montana also has a history of environmental injustice and racism. Montana’s small towns and rural communities, and our tribal communities suffer from the legacy of unregulated mining and natural resource extraction of the past, which polluted our waters and land. One such place is the Fort Belknap reservation, where a grassroots environmental justice group “Red Thunder,” led by elders and tribal community members, in collaboration with scientists and scholars, helped stop the cyanide leach mining that was poisoning their community. 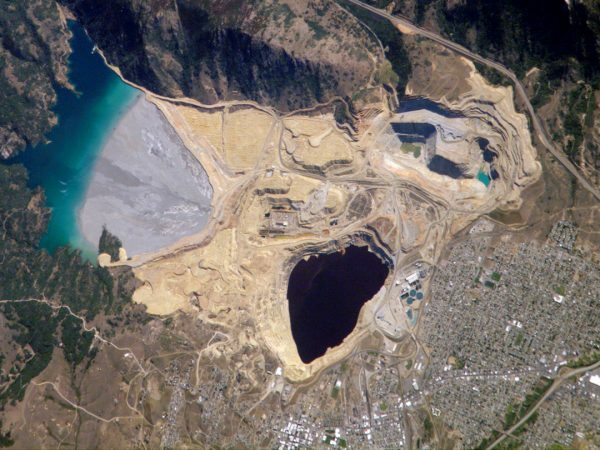 An open pit mine in Montana, the Berkeley Pit, has leached dangerous levels of metals into the water and is classified as a Superfund site. It’s so large you can see it from the International Space Station–which is how this photo was taken. Photo: NASA. Scientists and grassroots community members can work toward maintaining our most pristine places, where we live our lives and make our livelihoods, and restore areas of historic environmental degradation. MOB Prod: What is the plan for the organization going forward? Is bringing scientists into the political fray the new normal now? LaPier: As part of Vote for Science, on May 4th, March for Science is asking scientists, citizen scientists, and advocates across the country to contact their representatives to host a science-focused town hall meeting during the week of August 6th through 10th. Leading up to the 2018 midterm elections, we will encourage community members to learn about the science policies and values of their potential legislatures–at all levels, municipal, state and national. We are encouraging science advocates to register voters, especially new voters. We are asking advocates to hold politicians and policymakers accountable to upholding science for the common good. Central to our mission is diversity and inclusion. In the last year, the March for Science has integrated diversity and inclusion into the foundation and structure of our organization. We are working to ensure that diverse voices are amplified and integrated into all of our programming. We are working on making our materials multilingual to make science more inclusive and approachable to the public. Beyond the March for Science initiatives, I am personally invested in lifting up the voices of Indigenous peoples, knowledge and science. I am concerned with environmental justice issues and environmental racism on Indigenous lands. I am concerned that Indigenous communities are on the front lines of climate change, such as the flooding of coastal communities. (An issue that the PBS Newshour did a great series on.) I am concerned with food access and food sovereignty in Indigenous communities. I also want to celebrate the Indigenous knowledge and science of our elders that can help provide solutions to these societal issues that impact all of us. We need to break down the barriers between academically trained scientists and our Indigenous knowledge keepers for the betterment of society and the health of our earth. Rosalyn LaPier is an award winning Indigenous writer and ethnobotanist with a BA in physics and a PhD in environmental history. Dr. LaPier studies the intersection of traditional ecological knowledge (TEK) learned from elders and the academic study of environmental and religious history. As a longtime activist, her passions include environmental justice on Indigenous lands and the revitalization of Indigenous languages. Last year, as a National Steering Committee member, she was one of the organizers of the March for Science, the largest day of science advocacy in history, with over one million participants in 600 cities worldwide. She now serves on the board of March for Science. 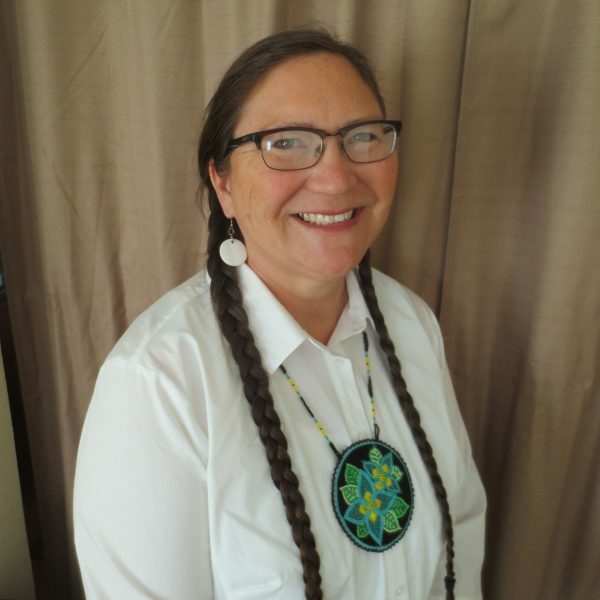 She is working on her third book “Plants That Purify: The Natural and Supernatural History of Smudging.” Dr. LaPier is an enrolled member of the Blackfeet Tribe of Montana and Métis. Banner image credit: Vlad Tchompalov.